The other night, I was skimming through the television guide and came across The Blob, the 1950s Sci-Fi/Horror movie. I have never seen a 1950s Sci-Fi/Horror movie that I did not like, so I tuned in to see what this one was all about. 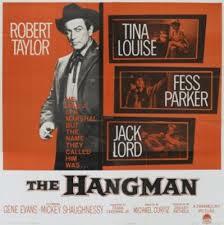 I had heard of it but, honestly, had gotten it mixed up with The Thing, which starred James Arness in the title role. The movie was almost over when I turned it on. A group of people were trapped in a diner as the Blob engulfed it. Police and a group of teenagers were watching helplessly. It was typical 1950s Sci-Fi/Horror fare. That is when I started noticing some things that I did not anticipate. The young man trapped in the diner was taking charge of the situation and seemed to be a major character in the movie. Then, the realization hit that he looked familiar. He looked like a young Steve McQueen. Hitting the Info button, I found out that it was Steven McQueen. I never knew that he was in The Blob or that he ever went by Steven. It was Aneta Corsaut, who played Helen Crump on The Andy Griffith Show. Here is the cute couple. For those who do not know, The Andy Griffith Show is my favorite show of all time. I own a model of Mayberry and was a member of The Andy Griffith Show Rerun Watchers Club. 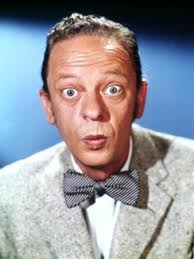 Heck, I even shook hands with Don Knotts. As you can probably tell, seeing Helen Crump in The Blob was pretty cool. That is when I started thinking. 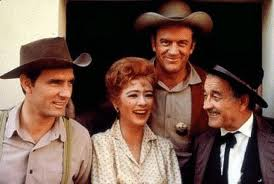 Helen Crump went from being Steve McQueen’s girlfriend in high school to being Opie’s teacher in Mayberry, North Carolina. She also went from being Steve McQueen’s girlfriend to Andy Taylor’s wife. Getting back to the movie, the people trapped in the diner are saved when Steven figures out that the Blob is afraid of the cold. He sprays it with a fire extinguisher and yells to the guys outside that they need to get more extinguishers. the high school principal hops into a hot rod with some juvenile delinquent looking dudes and heads to the school. This brings us to the most dramatic scene that I saw. As they rush to the schoolhouse door, the principal cannot find his keys. Everyone looks at each other trying to figure out what to do. Nevermind that a cop is standing there with a gun and could shoot the lock open. Instead, the principal picks up and rock and stares at it. With lives at stake, should he dare break the glass to open the door? After a dramatic pause, he does, and the schoolhouse gang comes to the rescue. The people trapped in the diner are saved, and the Blob is completely frozen. Steve realizes it is not dead, and the police officer tells him that the military is going to take it to the Arctic. Police Officer: At least we’ve got it stopped. Steve: Yeah, as long as the Arctic stays cold. I am sure this movie had some deep, underlying meaning from the time period. Probably something about how authority figures should listen to young people and not view them as a bunch of troublemakers. However, I learned a few more things. 1. You never know where life is going to lead. One day you are dating Steve McQueen, and the next day you are marrying Andy Taylor. 2. For many reasons, 1950s diners do not last forever. We have a great one in my town that could be on its way out. I promise that there will be a future post about that. 3. In the 1950s, juvenile delinquents drove some nice cars. These hot rods were top of the line. 4. Like them or not, principals have to make tough decisions – like saving lives instead of saving a pane of glass. 5. If Al Gore is right about global warming, then we are screwed. Stop worrying about a heat wave and start worrying about the return of the Blob! 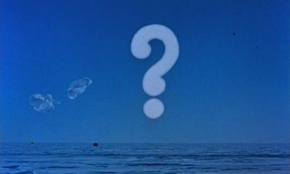 That dot landing behind the big question mark could thaw out at any time. When this blog was in its infancy, there were a couple of posts called Childhood Memories. One was about my parents taking me to an Elvis concert. Another was about the cross-country trips that my family took every summer. Yet, another was about our weekend excursions to Gatlinburg. It’s been a while since Childhood Memories made an appearance, and I felt it was time to bring it back out. I remember how great it was when we first got cable television. No longer was I limited to three real channels and a fuzzy PBS. There was much more television to explore. Australian Rules Football on ESPN. Cheap looking news sets on CNN. Slime pouring from the sky on Nickelodeon. It was a potpourri over never before seen material. However, a lot of cable channels were filled with before seen shows. Reruns of shows that had faded into off air oblivion only to be revised as time fillers. Some, like My Little Margie, went back to my mom’s formative years, but most were the shows that my older brother grew up with. Gilligan’s Island. The Munsters. The Andy Griffith Show (my all-time favorite). The list goes on and on. Everyday brought adventures that had been replayed countless times, but my favorite cable watching time was Sunday mornings. Before getting ready to go to church, I would hop in a chair; cover up in a blanket; and turn it to TBS. First, I watched The Three Stooges beat the crap out of each other. People talk about violence on television these days, but I don’t think anything is like seeing a guy get hit over the head with a crowbar. Going against the grain, I liked the Shemp version of the Stooges a lot better than the Curly version. Curly worked at being funny, but Shemp brought it naturally. The best of the Stooges. Moe was just meaner than Hell, and I am not sure what role Larry was trying to play. 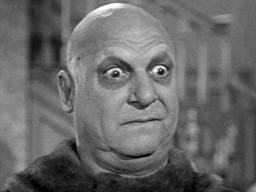 Whatever the case, I watched The Three Stooges religiously on Sunday mornings. However, that was just the opening act for the true reason to watch TBS. When the Stooges got out of their jams, it was time to watch the Robinson family never get out of theirs. I was fascinated by Lost in Space. Will and Robot. Don and Judy. John and Maureen. Penny. Dr. Zachary Smith. Heck, the Jupiter 2 was a character all its own. They are not Swiss, but they are the Robinson’s. It was an awesome show, but here is the thing. Just as I liked Shemp better than Curly. I liked the black and white Lost in Space better than the color one. The black and white version had a seriousness to it. The first episode was a realistic glimpse into the space program. There was suspense as Dr. Smith and Robot were out to destroy to mission. When the family found themselves lost on unknown planets, danger faced them at every turn. A trip in the Chariot meant avoided whirlpools, earthquakes and giant aliens. I can’t describe how cool it was. In short, it went the way to The Three Stooges. I read that the show changed because it had to compete with Adam West’s campy version of Batman. It wasn’t a good decision, but hindsight is 20/20. 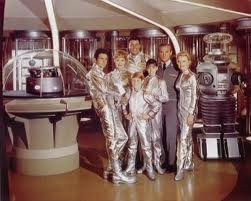 When Lost in Space was over, it was time to get ready for church. As I sat in the pew drawing on offering envelopes, I though about Stooges poking the eyes out of each other and Robot saying, “Danger, Will Robinson!” The whole time I was wishing that I was back home watching TBS. I remember many episodes from those shows, but I don’t remember much about what I heard in church. Yesterday, I watched the last episode of Centennial, which featured Andy Griffith. 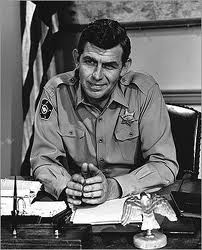 This morning I woke to the news that Andy Griffith had died. Everything that can be written will show up on the Internet in the next several hours, and there is not much that I can add. Except, The Andy Griffith Show is my favorite television show, and he portrayed my favorite television dad. In the early days of this blog, I wrote a post about my fascination with his show, and I feel that it is appropriate to link it here. Rest in Peace Mr. Griffith. You provided millions with laughter and enjoyment. Before proceeding, I have an important announcement to make. The “Mystery Reader”, who spiked my View statistics a few days ago, has been found. She is one of the cool librarians on our campus and has a great blog of her own. So, head over and check it out. Now, to our regularly scheduled blog post, a continuation of my goal to find words of wisdom in movies that star certain people. To read the rules that I placed upon myself, you may want to skim through the last Movie Wisdom post. This one delves into the cinema classics of Don Knotts, one of my all time favorites. 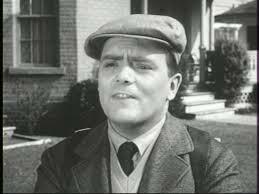 He is best known for The Andy Griffith Show and Three’s Company but starred in several movies as well. Without further delay, here is the wisdom within the works of Don Knotts. “Everybody pays taxes! Even businessmen, who rob and cheat and steal from people every day. Even, they have to pay taxes!